1. We've had a lovely week of fall-esque weather between the hours of 6:00-10:30 am and anytime after 7:00 pm. 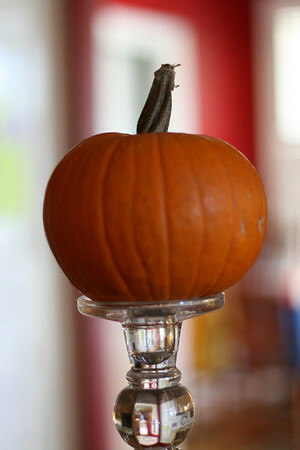 So I bought a small pumpkin. But that $2.97 purchase, as well as adding my fall foliage to our front door hanging basket thingie, is as far as I've gone with regards to fall decorating. 2. Did you know I am a tap dancer? Well, not yet, since I haven't really tapped since the Bicentennial and my mom's frosty blue eyeshadow was in style. But I plan to be a tap dancer again. I'm taking a beginner tap class once a week to prepare to dance with Annelise in the Mother-Daughter routine at her recital in the spring. On stage. In a costume. In front of an audience. Gulp. 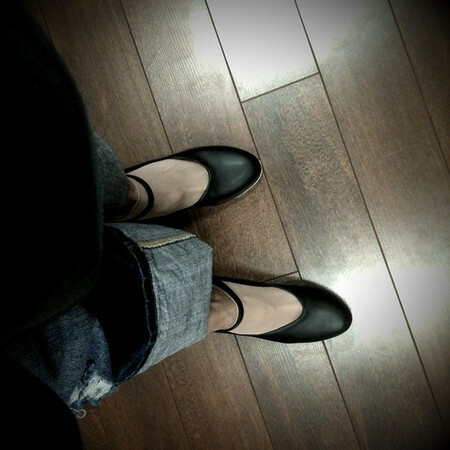 Yesterday I bought a pair of ladies high heel tap shoes and felt the excitement of starting something new. Then I almost passed out when it came time to pay. I've been hanging on to my little punch card that the dance store gave me (Annelise gets her shoes there) so I was thrilled when the girl punched the rest of that card, gave me a new one and told me I was saving $10. They were still $47.00!! Seriously. Last night was the first class so I buckled up my tap shoes and tried to swallow my fear. We practiced flap ball changes, shuffle hop steps, shuffle leaps and then the flap, pop, brush, heel, toe, heel step. There was some sweating. It was fun. Annelise couldn't wait to hear (and see) what I learned, I'm so glad she can help me. What I lack in musicality I hope I can make up for with spirit and a smile. 3. Annelise wrote her letter of apology to her teacher about the incident. I thought she might complain about having to do it but she was highly agreeable (lingering effects of guilt and humiliation, you think? ), so that was good. I really appreciated all of your comments, thoughts and advice about that whole situation. It's true, parenting is not for weenies. 4. Okay, please don't slap me but I'm going to talk about nail polish one more time. I guess after not wearing it for so long I'm easily entertained. Today I popped into CVS, which is a store that really annoys me because of their misguided concept of organization and their annoying little red cards that are supposed to save you money, and I really don't want to mess with another card, I just want to buy what I need at a reasonable price and get on with my life. So, no, I don't shop there often. This morning it was closest and I was lazy. Of course had to walk by their selection of polish by my new BFF, Sally Hansen. For some reason Navy Baby spoke to me and I could not resist her charms. Yes, it's alarmingly close to Midnight in NY, but there's no glitter and it's much more blue instead of black. Good, I'm glad we could clear that up. I also came this close to buying an air popcorn popper at CVS. 5. After this week's disturbing Grilled Cheesus episode I think we're finally breaking up with Glee. I know I've said that before but then I'd always give it one more week and then another. It seems like they have a few *safe* episodes then throw in a raunchy, boundary stretching one or two, then back off for a while and then repeat the manipulative pattern. This week's show was a different level of offensive though. So that's that. I'm going to try not to miss the music, Mr. Shue, Sue and the whole gang. Hope y'all have a fabulous weekend! A's note to her teacher was so sweet. Great idea. I am with you on Glee. The first couple of weeks were just "ok" then grilled cheesus just seemed to push it over the edge for me. The way I look at the tap shoe thing is that ours will last YEARS! I figure I will never tap the soles off the bottoms seeing I am not Ms. Jane. haha! The girls shoes we have to buy every 6 months. ha! Love the note. That is so sweet! Her little tender heart is precious to me! CVS....hate it. I agree on the organization issue. What are they thinking? I love that you're tap dancing! Very cool. I have been so impressionable about nail polish this season. In fact I own the Commander in Chic and now might just have to try Navy Baby. Although whenever I get a glimpse of my painted nails I freak out a little because it seems like someone else's hands on the end of my arms. With you on Glee, too. I usually watch to screen it before my h.s. girls try to watch it on weekends but I've just been deleting them lately. Sigh. It was a good concept until they decided to push the envelope. You will be her hero for dancing with her on a stage. Love the nail polish on others but I just can't get into the dark colors on me. I drove around town until I found Ski Teal You Drop only to then be disappointed. I need a little bit of sparkle I think. Also, my fingernails are very long and so I think only very subtle colors work. I LOVE tap dancing! I am so excited for you to be doing that. I seriously think more adult women should do it, it's good for the soul (hmmm, maybe I should check into doing that myself). My cute mom takes tap and is often in the oldest person in the dance recital. 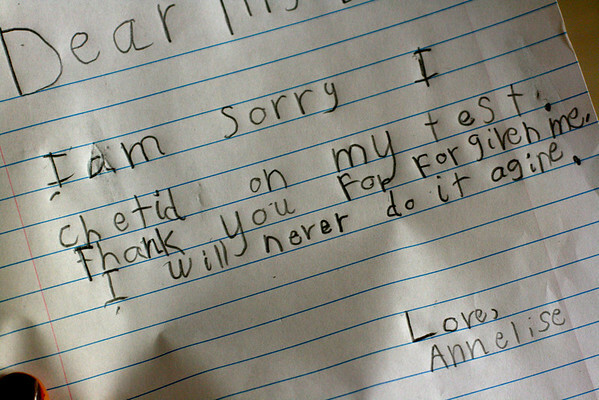 Annelise's apology letter is just too cute. You're cracking me up with your infatuation with these dark nail polish colors, but I think they're actually growing on me...well done! I broke up with Glee this week too. The Grilled Cheesus was super offensive to me, and as the episode went on and Finn kept praying for terrible things I just kept squirming. After fast forwarding through most of the episode I immediately when to my DVR timers and deleted it. It's sad that they went too far. good for you for the tap dancing! wow-probably harder than running! Is 41 Too Old for Forever 21?